Last Friday we rolled out an update to our services. This update, labeled 3.8, is most likely the biggest change we have made in our product. In this post I will guide you through the changes. If you have three minutes, stay with me, there are some truly interesting additions and changes to brag about. As one picture is worth a thousand words, I thought to illustrate our progress with a screenshot from the 3.8 Plumbr in action. On this screenshot, there are two changes I wish to talk about. First of those is the significantly improved value proposition on memory leak detection. 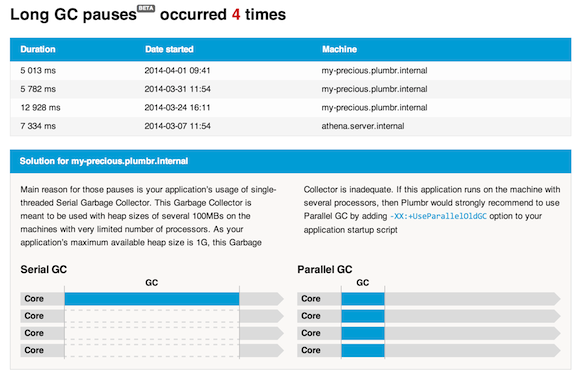 Until version 3.7 Plumbr was only able to communicate the presence of a memory leak. When the application did not contain one, Plumbr was completely silent. From Plumbr 3.8 we communicate the lack of problems as well – when you monitor your services with Plumbr agent attached the green lights on memory and permgen leak sections give you the confidence that the application does not leak memory neither in heap or permgen. As seen from above – the JVM is deployed on a machine with four cores but is configured to run on Serial GC. Serial GC uses only one core, thus the first significant win is to migrate to Parallel GC, shortening the individual pause times significantly. We have kept the GC pause detection in closed beta for two months and have detected thousands of long GC pauses during the period. But we admit that our solution algorithms are not yet mature, so we are releasing this functionality in Beta mode. In case you face unexpected behaviour, let us know and one of our core engineers will contact you soon. We continue to work towards expanding the set of performance problems Plumbr is able to safeguard your application against, so stay tuned for updates already in following months. Or, better yet, go and get rid of your performance problems with the help of the latest Plumbr release.